One of Seth's co-workers, Sondra, is a Westie-lover as Seth and I are. Over the summer, she had to make the difficult decision to put down her 15 year old Westie, Maggie. Maggie had lived a long and good life and was ready to go. 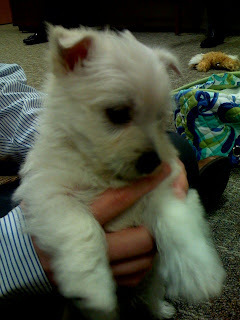 A month or so later, Sondra bought a new Westie puppy, Daisy, who was only 6 weeks old at the time she picked her up. Here's a pic of Daisy just hours after Sondra picked her up from the breeder. Last night, Seth told me that Daisy died. I couldn't believe it. He said that Daisy got into their coy pond and couldn't get out and drowned. Sondra was the one who found Daisy. My heart broke immediately and I cried for Daisy and for Sondra. I just couldn't believe it. Sondra doesn't have kids and really seems to treat her dogs like her own kids - they are her world. Daisy was just a few months old and just starting life. Part of what breaks my heart is to think of Daisy and how she must have struggled, been afraid, and just had to give up. I know I shouldn't humanize a dog, but we truly don't know how they feel, but certainly they know fear and know when they are in trouble. I feel as if I've lost my own pet, but was thankful to have Three beside me when I heard the news. She always seems to know and understand when mommy is upset. I picked her up and looked into her eyes and told her that her Westie sister, Daisy, had gone to doggie-heaven. She licked my face. It's going to sound funny, but I really thank God for my Three because she's brought a new kind of love to my heart. It allows me to sympathize with people who lose their pets in a way I know I could not have before we got Three. It's a special kind of love and connection that I can only assume happens to all true dog-lovers. I sometimes wonder how much more of that I'll feel if Seth and I have kids down the road. I know little Daisy is in doggie-heaven and while she lived a short, short life, I know she'll be OK.